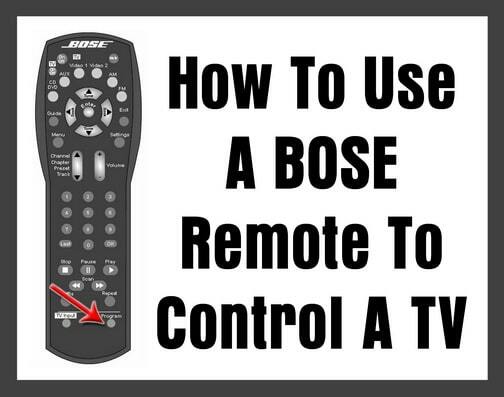 Here is how to use your Bose remote to control everything on your TV. There are a few different ways depending on the Bose audio system you have. Below are 2 methods to control your BOSE remote to work with your TV. Step 1 – Turn on the TV. Step 2 – On the Bose remote press the TV button. Step 3 – To display the Bose system menu on the TV, press System. Step 4 – The message “SYSTEM: SEE TV” will appear on the media center display. Step 5 – Use the remote supplied with the TV to select the video input that allows you to see the Bose system menu. Step 6 – On the Bose remote, press the Right arrow to highlight the “Remote Control” icon then press ENTER. Step 7 – Press the Down arrow to highlight “TV Brand” then press ENTER. Step 8 – The highlight will shift to the right. Step 9 – Using the Up arrow and Down arrow on the remote, find and select the brand of your TV from the list provided, then press ENTER. Step 10 – Move down to “TV Code:” and press ENTER. Step 11 – The highlight will shift to the right. Step 13 – Press (TV) On or Off. Step 14 – If the TV turns off then you have the correct code. Step 15 – If the TV does not turn off then use the next code and press (TV) On/Off again. Step 16 – Continue selecting codes until you find one that works. Step 17 – Press Exit to leave the system menu. Step 1 – Find the setup code for your TV. Step 2 – Turn on both the BOSE system and TV. Step 3 – Press and hold the Program and TV On/Off buttons for 3 seconds. Step 4 – The remote source buttons will light to signal that you have entered programming mode. Step 5 – Use the number keys to enter your TV’s setup code. Step 6 – Press Program once to complete programming. Step 7 – The remote will flash once to indicate successful programming. Step 8 – To confirm that, use the remote to turn your TV on and off. To control other components with your Bose Remote such as TV, CBL, DVD, BLU-RAY DISC, DVD-R, HD DVD, VCR, DVR, A-ACC, V-ACC, COMBOS, TV/VCR, TV/DVD, TV/VCR/DVD, VCR/DVD, DVD/DVR, CBL/DVR, or SAT/DVR device, check these PDF files for the codes needed…. Need help using your Bose remote to control your TV? Please leave your question below. We got a new Vizio TV D50 E1. Our Bose universal remote will turn the TV on and off (it was set up to a different Vizio TV before). We can still run a DVD from the universal Bose remote. When we click on menu to choose an app like Amazon videos or Netflix, it won’t open that menu. It opens the menu for the TV, and won’t let us access any of the smart features on the TV. We tried all the codes for Vizio TV. I have a Bose CineMate GS Series ii home theater speaker system. It has a Universal Remote. I would like to use the Bose remote to control my TCL Roku TV. I have tried all of the codes listed in the manual provided with the Bose system – 12434, 13183, 10698.